@angelangie can this thread be included in the directory? i want to tag some more people but I’m afraid they want to stay at the main thread? Haha. Need to have @Yoo In Na to update right? I will provide info if necessary. Thanks for calling me over! I found this while browsing through Youtube yesterday. It all started in 2014 I guess? 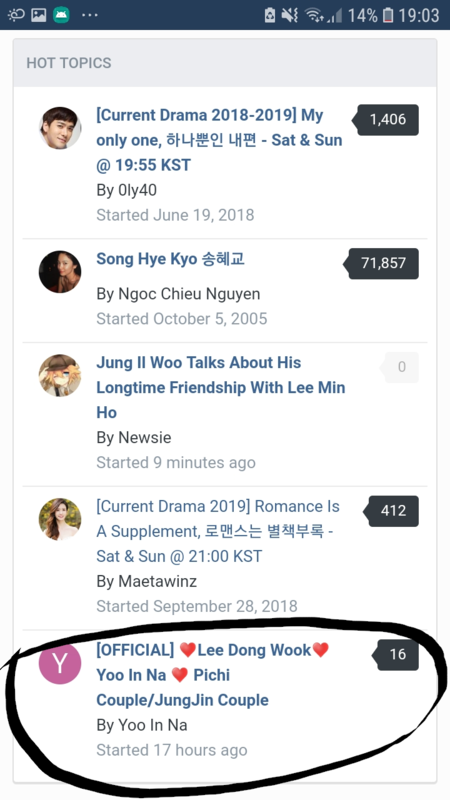 There's a shipper thread created for Lee Dong Wook and Yoo In Na if you guys are interested. Yes they 1st met in 2014 on an award show. YIN made voice and picture cameo in LDW drama Bubblegum. Picture cameo as in her pic was hanging on the wall, not as in had scenes other than her voice only. The Bubblegum PD was also the PD of QINM (YIN drama). That's probably why cameo. 3 Years after QIHM ended the PD still had affection for her to have her cameo. Bubblegum casts regualrly meet up. Then LDW & YIN's mutual friend the Bubblegum & QIHM PD sent a foodtruck for LDW & YIN for TYH. @Far^away I guess youre new and hadnt watched them in Goblin, since you didnt know about 2014 until you saw that vid? LDW and YIN made me delurked here in Soompi. I ship them very much. Amazing chemistry, since way back. I saw them in the 2014 award too, noticed the chemistry already. Glad they work together and became friends. Would be nice, if they actually couple up for real. Love LDW and YIN. they was first couple that i ship the most. really excited to see them frequently. ktcjdrama reporting for shipper's duty! Amazing how quickly, I have become I invested in **cough **obsessed with this couple. Saw them? As in you were there personally on the show?? Or just from clips like the rest of us?